Nicknamed “The Nuisance” for his sandpapery, face-wash, stick-to-the-groin style of play on the ice, Dale Hunter was a difference maker for every season of his 19-year NHL career. Though he never won the Stanley Cup, he must be considered a winner regardless. Hunter did everything in his power to ensure victory for his teammates. Notice we said “teammates” – that is because this tough as nails center put everyone else on the team ahead of himself. If we said “team” instead, that would place him on the same level as the rest of squad, and ultimately detract from the character Hunter showed in bettering those alongside him, both in the locker room and on the ice. He had the will to win, and it was contagious. Few players cared more for their teammates than Dale did. Now, if you happened to be wearing a different colored jersey or sat on the opposite bench, make no mistake – you were going to pay a price. For all of the humility and respect that Hunter exuded over his teammates, it was the other end of the spectrum when he went up against the opposing team. Hunter lived up to that “Nuisance” moniker and behaved like a junkyard dog in the face of battle. His competitive nature oftentimes appeared as being downright mean and ornery. For 19 seasons Hunter delivered punishment to opposing NHL teams, but he was far more than just a player who finished his checks and got his stick up. In a career that included stops with the Quebec Nordiques, the Washington Capitals, and the Colorado Avalanche, he achieved an accomplishment in hockey that will stand for all of time. Hunter owns a record that will never be eclipsed, and it defines who he was as a player. Dale Hunter is the only player in NHL history to have registered over 3,000 penalty minutes and to have scored 1,000 points in his career. This will never happen again, and we shall explain why. The Nordiques drafted him in the second round of the 1979 NHL Entry Draft. Hunter would remain a distinct face for the franchise for seven straight seasons. For those fortunate enough to witness it, the Nordiques of the early to mid 1980s were the perfect blend of grace and physicality. The sheer beauty of the three Stastny brothers – Anton, Marian, and Hall of Fame brother Peter – as they glided across the ice, the finesse and scoring ability of Michel Goulet, Real Cloutier, and Marc Tardif, and the bell-weathered goaltending of Dan Bouchard. These gentleman represented the artistry of the Nordiques. Then you had a collection of soldiers and gonzo assassins that made playing against Quebec utterly miserable. Andre “Moose” Dupont, Wally Weir, Randy Moller, Pat Price, and more. The ring leader of these more pugilistic players was undoubtedly Hunter. The difference between he and the others though, was that despite high penalty minute totals “The Nuisance” was still one of Quebec’s top scorers. In his seven seasons with the Nordiques, only once did Hunter’s penalty minute totals fall below 200 in a season (1986-87), and that was simply because he only played 46 games that year due to a broken leg. Still, in those same 46 games he compiled 135 PIMs. Hunter’s highest outpouring for penalties came during his sophomore season of 1981-82 when he posted 272 minutes. Most importantly though, Hunter scored double digits in goals for all seven seasons with the Nordiques, including the injury-shortened one. On four occasions he eclipsed the 20-goal mark in a season. Hunter’s finest season offensively in Quebec was the 1983-84 season when he scored 24 goals, 55 assists and 79 points in 77 games. This would be the only season in Hunter’s career in which scored more than a point per game. The 79 points were the highest total of his entire NHL career, although he would tie it again nearly a decade later. His 55 assists were the second-most of his 19 seasons. 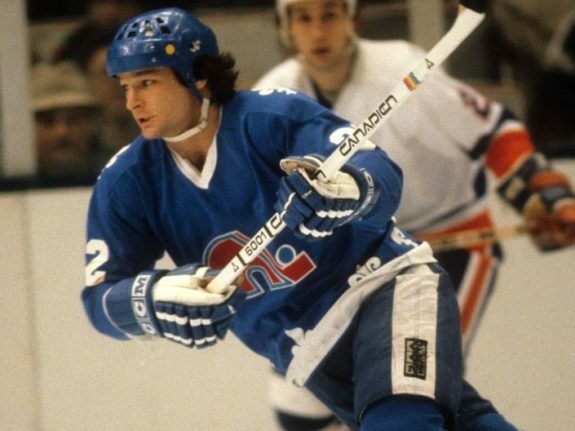 Hunter’s play and tenacity established him as the heart and soul of the Nordiques. He also became a dreaded thorn in the side of the Montreal Canadiens – a Habs killer, so to speak. Hunter eliminated the Canadiens when he scored in overtime in the decisive Game Five of the opening round of the 1982 playoffs. He was also a key source for ignition in the infamous “Vendredi Saint Brawl” in which the Canadiens issued a bit of vengeance of their own during the 1984 playoffs and eliminated the Nordiques. In what many felt was a major contributing factor to the downfall of the Nordiques and their glory days, Hunter and goaltender Clint Malarchuk were traded to the Washington Capitals on Jun. 13, 1987 in exchange for Alan Haworth, Gaetan Duchesne, and the Capitals top pick in the 1987 NHL Entry Draft. The trade actually came on the same day as the Draft, and the Nordiques utilized the corresponding 15th overall pick to select arguably the greatest player in the franchise’s history, Joe Sakic. A huge win and loss for the Nordiques all in one shot, as there was truly no replacing Hunter’s character no matter what the return may have been. Hunter’s totals with Quebec came out to 523 regular season games, in which he scored 140 goals, 318 assists and 458 points. He was pretty much halfway to 1,000 points, and had done so in seven years. Separately, Hunter’s penalty minute totals from his Quebec years are rather staggering – they came out to 1,545 minutes. Yet again he was at a halfway point, but this time to the 3,000 minutes mark for penalties. The Capitals, on the other hand, had acquired a centerman who kept their middle situated for almost a dozen more seasons. From the 1987-88 season until the trade deadline of the 1998-99 season, Hunter was one of the best and most beloved Capitals. 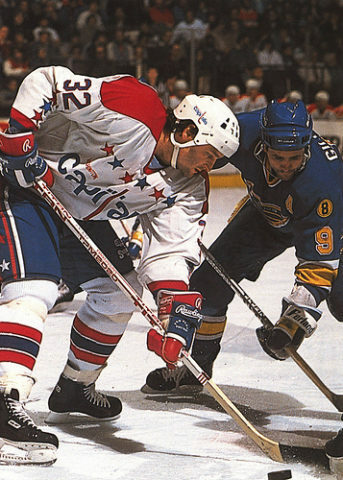 With star power in the likes of Peter Bondra, Adam Oates, and Olaf Kolzig, he was one of the players that kept the Washington organization relevant throughout the 1990s. A look at Hunter’s numbers with the Capitals saw him tie his personal career high of 79 points in a season when he did so again during the 1992-93 campaign, off of 20 goals and 59 assists. Those same 59 helpers became a career high as well. The 28 goals that Hunter scored as a Capital during the 1991-92 season equaled his highest in a season (he also scored 28 during the 1985-86 season with the Nordiques). Although Hunter’s playing time and scoring diminished with age, his penalty minutes still never went below 100 in a given season. He maintained his in-your-face play and was arguably the Capitals best two-way center well into his 30s. Hunter gave it his all to bring a Stanley Cup championship to the Capitals – he truly did. No matter his heroics (and antics) both in the regular season and playoffs, the trophy was one that evaded him for all of his years as a player. Oddly enough, both of Hunter’s brothers to have played in the NHL – Dave and Mark – each have their name inscribed on Lord Stanley at least once. Dale and the Capitals did however come close. 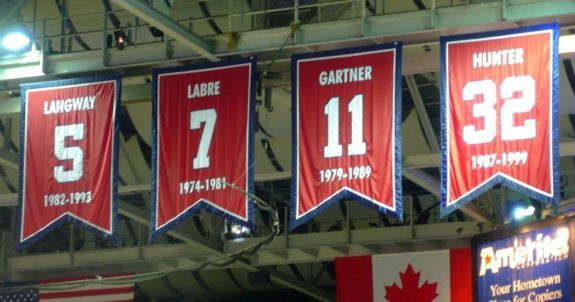 Dale Hunter’s heroics for the Washington Capitals would eventually see the organization retire his jersey number (Photo Credit: by Patrickneil (CC BY 3.0 (https://creativecommons.org/licenses/by/3.0)), from Wikimedia Commons). Despite being 37 years of age, Hunter played in every single regular season game (82) for the Caps that year and every single playoff game as well (21). He scored eight goals and 18 assists for 26 points that regular season. Of the 103 total games he played that year, one game is the most important to our story. On Jan. 9, 1998 in a Washington 4-1 win over the Philadelphia Flyers, Hunter picked up three assists in the third period to lead his team to victory. First a primary assist on the ultimate game-winner by Bondra. Then a secondary assist on Mark Tinordi’s goal less than a minute later. Finally, a primary assist on a goal from fellow tough guy Craig Berube with under two minutes remaining in the game. What makes those three assists so important? Well, they were the 998th, 999th, and 1,000th points of Hunter’s career. At the time that he scored his 1,000th, Hunter had already accumulated 3,408 penalty minutes. He would play one final NHL season after that. While Hunter would begin the 1998-99 season as a Capital, in recognition of his service and due to the respect that they had for him, the Washington organization gave him one final opportunity to win the Stanley Cup. The Capitals traded Hunter at the 1999 trade deadline on Mar. 23 to the Colorado Avalanche in exchange for a third-round pick in 2000 NHL Draft. The Avalanche were considered a forerunner to win it all that year. Not only would Hunter give Colorado the aid of a wily veteran at the most important time of the year, but it would give him one more crack at a Cup. He would play 12 games with the Avalanche after coming over in the trade, and scored two goals and four assists. Hunter also picked up the final 17 penalty minutes of his career too. In an Apr. 3, 1999 game against the Edmonton Oilers, Hunter was assessed the final regular season major infraction of his career when he fought Kelly Buchberger and received five minutes for fighting. Colorado finished at the top of the Northwest Division. Once in the playoffs, Hunter played in all 19 postseason games for the Avalanche. Oftentimes he centered a line with two other pesky veterans, Claude Lemieux and Theoren Fleury. Colorado would come within one game of playing in the Stanley Cup Final, but fell to the eventual champion Dallas Stars in the seventh game of their semifinal series. Hunter scored a goal and added three assists during those playoffs. Retiring from active play once the season ended, Hunter finished his career with the following regular season totals: 1,407 games played, 323 goals, 697 assists, 1,020 points and 3,563 penalty minutes. His penalty minute totals are the second most in NHL history. Dale Hunter’s place as the only player in NHL history to score 1,000 points and have at least 3,000 penalty minutes will stand forever. There is really no question of it. For starters, longevity is a must-have component for this discussion. Hunter played 19 seasons in the NHL, and did not reach his 1,000th point until his 18th season. 12 seasons saw Hunter play in every game, which attributed to him playing a total of 1,407 in the regular season. In order to play in that many games and for that long, he needed to be talented enough, relevant enough, and healthy enough to do so. Then you must consider the rarity of his supreme penalty minute totals. With the dramatic decrease in fighting that the league has seen in recent years, no player will be able to accumulate enough minutes in the box to even approach 3,000. In the entire history of the NHL, only nine players have ever reached the 3,000 mark – Tiger Williams, Hunter, Tie Domi, Marty McSorley, Bob Probert, Rob Ray, Craig Berube, Tim Hunter, and Chris Nilan. That is it. At the time of this article, no current player in the league has even surpassed 2,000. To reach the same amount as Hunter and his counterparts just will not happen. Forget about it. Lastly, there must be recognition as to how unique a player Hunter truly was. Put penalty minutes aside for a moment, and recognize that Hunter possessed the skill set to be an effective second-line center in the league for nearly two decades. He likely would have been on the top-line for a lot of teams, and would have done so were it not for centers like Peter Stastny, Oates and Mike Ridley being ahead of him for the teams he did play on. Of the other players to surpass 3,000 PIMs, the next most amount of points scored came from Williams who notched 513 (241 goals, 272 assists) in 962 games. That is just ever so slightly more than half of Hunter’s career points. No one else even comes close. Imagine how many more points he could have accumulated had he not be assessed so many penalties. Take all three of those aspects – the longevity, the nastiness, and the production – and they not only summarize the kind of player that Hunter was, but they drive home the point that this achievement belongs to him forevermore. Just like Darryl Sittler’s 10-point night, Wayne Gretzky surpassing the 2,000-point plateau, and Bobby Orr’s eight consecutive Norris Trophies, no player will ever replicate Hunter’s career totals – they may get one, but only he shall ever have both.